Today we have a treat for you: The world premiere of a short film about Buckminster Fuller: inventor, father, author, and thinker. The video, produced by Quoted Studios, is below—but first, I want to give you a few words about the man in case you're not familiar with him. Fuller was a fantastic man, in both senses of the word. He popularized (and patented) the geodesic dome—which, for those of you who haven't heard of the man or his dome, is perhaps best known as that big silver chunky-sphere at EPCOT. He designed all sorts of structures, many related to home, daily life, and conservation. Much of this was because he lost his daughter Alexandra to polio and spinal meningitis. He felt that the environment in which she lived was not up to snuff, so he strove to build something better. 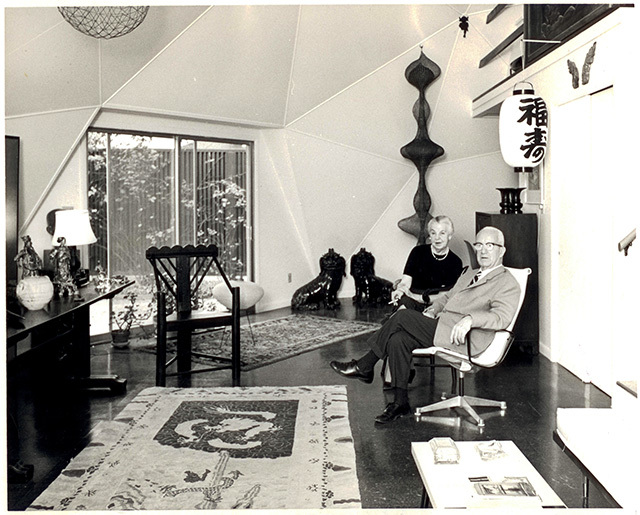 Anne and Buckminster Fuller in their Dome Home. Photo courtesy of RBF Dome NFP. 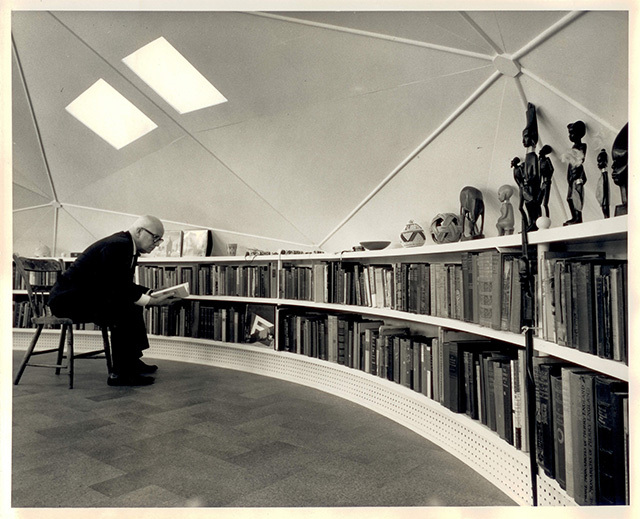 Buckminster Fuller in his study at the Dome Home. Photo courtesy of RBF Dome NFP. "Bucky" Fuller is one of the legendary figures of the twentieth century. His inventions were numerous, beautiful, and often a bit weird: Dymaxion house, Dymaxion car, Dymaxion map, Montreal Biosphère. There is a beauty in these constructions, plus a touch of the mystical. The theme of the inventions is "doing more with less" (a common phrase Fuller used), for the betterment of all humankind. Buckminster Fuller on The Geodesic Life | The Experimenters | Quoted Studios from Quoted Studios on Vimeo. This is the first video in a series called The Experimenters. We'll premiere the next two videos in the coming weeks. Stay tuned! Studs Terkel: One of the most original spirits of our time. Buckminster Fuller sings of man's potency. Everyone aware of his work agrees that Buckminster Fuller's one of the original minds of our time. Buckminster Fuller: I was born in the era of the specialist. I set about to be purposely comprehensive, just the opposite. And I made up my mind that you don't just find out something to entertain yourself, you must find out things in order to be able to turn everything, not just in a philosophical statement, but into actually tools. I must reorganize the environment of man by which then greater numbers of men can prosper. That's been my main undertaking. Studs Terkel: We can turn this tape, there's no problem. There's so many questions to ask you, Mr. Fuller. 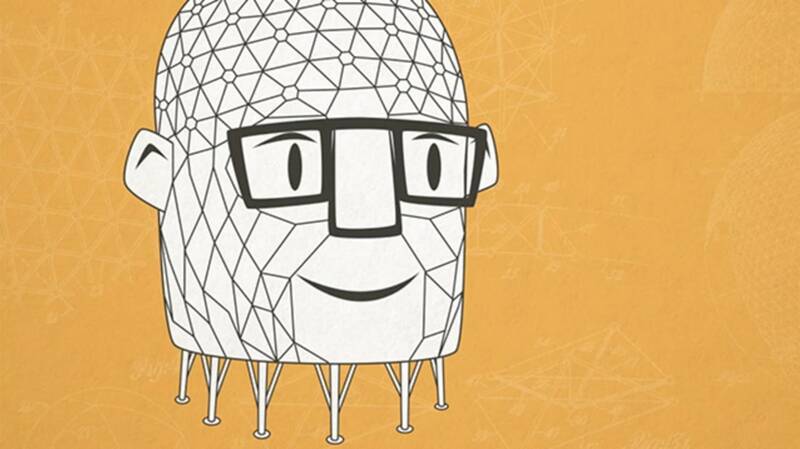 Buckminster Fuller: You can call me Bucky. Buckminster Fuller: I was married in World War I. Our first child was born and she caught this spinal meningitis and infantile paralysis and it was an awful struggle. This child lived to just before her fourth birthday and she died in November 1922 and so for 5 years I was feeling really horribly sad about this kid. I felt that if the kind of technology that went into making a battleship and an airplane and guns had gone into… I was sure this child had caught these things out of the environment and I was sure that there was something wrong about our environment. In the Navy I had learned how to navigate, I've used mathematics very powerfully. I learned how to calculate. I was sure things were just not being done in logical ways. Buckminster Fuller: By 1927 our second child was born and at that time and I had suddenly a new child after 5 years of going without the girl we loved so much. I said I got a chance now to look out for this new life and I'm going to have to really re-think everything I have. I had absolutely no money and suddenly this new child and everybody tells you you got to earn a living. I said I think this is absolutely a blinding thing. I'm either going to say you go out to make money or you're going to make sense. Buckminster Fuller: I recall in Chicago wheeling my little child in her baby carriage in Lincoln Park. I was amazed, because a little biplane went over Lincoln Park. Airplanes were not very common in those days. I said, "Isn't it amazing. Here's my child looking up at that airplane and that airplane in the sky is as natural to her as a bird.” Because when I was born, the airplane did not exist. It was really the start of the beginning of impossible things happening. Buckminster Fuller: Yes. So I'm going to see what happens if I will take the kind of technology that's going with the sea and the sky and apply it over to the land. Studs Terkel: So many things to ask you, Bucky, that you have foreseen. Thinking of your geodesic dome, do you see actually roofed cities ever? Buckminster Fuller: We're continually doing more with less, and my geodesic domes do a very great deal with very little but I think they're only symptomatic, Studs, and I wouldn't be surprised if we find ways to control that environment over the city without even seeing the roof there, there would be an electrical field control so forth. We could make the water go and dump over here, and pipe it there, and so forth, whatever it may be. Buckminster Fuller: Time and again, I am asked, "Who else do you know who thinks the way you do, or does what you do?" I find it very strange to have to answer, "I don't know anybody else." It's not because I think of myself as unique, but simply because I did choose a very different grand strategy, and not because I think that I have capabilities that other human beings don't have. Buckminster Fuller [NOT ANIMATED]: My daughter, who I was wheeling the baby carriage, who had an airplane as normal in her sky, now has her daughter and that daughter was born in New York. They were right in the flight path for flights out of LaGuardia and Idlewild. This little child then, in her crib, would hear this roar of those airplanes, and she saw many thousands of airplanes before she ever saw a bird. I saw the children's books that were sent to her, which were the traditional, what a children's book would be. They're the same children's books that were sent to me when I was a child. They were farm yard. There was a barn and all the nice natural things. The child would see the horse, and the pig, and the cow, and the goat, sheep, rooster. My granddaughter, in New York City, looked out the window and saw the airplanes, and she saw the automobiles going by by the minute, but when they gave her this farm book, she didn't had never seen a sheep or a cow. It was as if you gave her these imaginary pictures of dragons and things. She was very accommodating. She laughed about it, it was very amusing. They weren't natural to her.